We’re spoiled to be football fans in the modern era of the game. Every Sunday over the past 15-plus years, we’ve been blessed with the opportunity to watch some of the greatest athletes ever to grace the gridiron put everything they have into achieving one common goal; winning. Over time, we’ve become so accustomed to seeing all-time greats play that sometimes, we don’t take the opportunity to sit back and enjoy watching the league’s best players perform to a standard that we may never see again. This is especially true when it comes to the quarterback play that we’ve been desensitized to over the years thanks to the remarkable performances of players like Tom Brady, Aaron Rodgers and Peyton Manning, to name a few. Instead of appreciating them for what they are – arguably the greatest quarterbacks of all time – some of us try and find a reason to bury them. Tom Brady isn’t the best because of ‘deflategate.’ Aaron Rodgers isn’t the best because he inherited an already successful team from Hall of Fame quarterback Brett Favre. Peyton Manning’s historically great 2013 season means nothing because of an underwhelming playoff record. The list goes on. New Orleans Saints quarterback Drew Brees is in the same boat, and he may have it even worse, because, arguably, he’s already underrated in comparison to the aforementioned titans of the quarterback position. In Week 3 of the 2018 season, Brees broke Favre’s NFL completion record. In Week 5, he surpassed Peyton Manning’s record for most career passing yards. By Week 17, he had earned PFF’s third-highest single-season grade by a quarterback, and broken his own record for single-season completion percentage – the fourth time he’d either tied or set the record. Yet, some spectators are still reluctant to put Brees in the all-time great category. 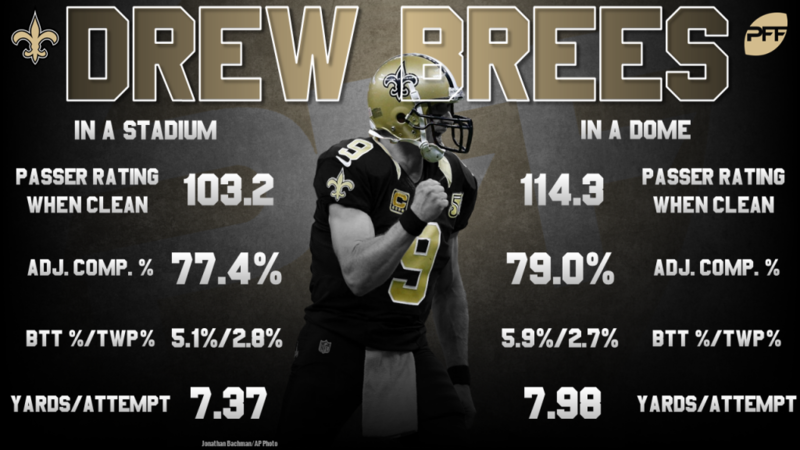 Like many of his peers, he has a knock, and that knock is the common misconception that Brees’ statistics are inflated because he’s played a large proportion of his games in a dome or enclosed stadium. This, of course, is far from the truth. Just by watching Brees’ 2018 season alone, his 18th year in the NFL and his 13th year with the Saints, it’s hard not to include him in the conversation for one of the greatest quarterbacks ever to play the game. Through 17 weeks of the regular season, he earned an overall grade of 94.7 and a passing grade of 94.0, the third and fourth-best single-season marks of the FFF era (2006-present), respectively. He finished the regular season with a 3:1 big-time throw to turnover-worthy throw ratio (which was good for third-best among qualifying signal-callers), he finished second in passer rating from a clean pocket (125.6), third in turnover-worthy throw rate from a clean pocket (1.06%) and to top off a campaign that had him mentioned as a sure-fire MVP candidate for most of the year, he broke the PFF record for single-season adjusted completion percentage. Despite this historic production, there are still those who shrug their shoulders and dismiss the numbers because they feel that his home field, the Mercedes-Benz Superdome, shields Brees from the outside elements that would otherwise affect the game. However, this isn’t the case. If we were to look just at his 2018 season and take away the games he played inside an enclosed stadium, he still would have equaled his 2011 NFL record for completion percentage (71.2%), and he still would have shattered the PF record for adjusted completion percentage (83.7%). It’s been this way throughout his career. 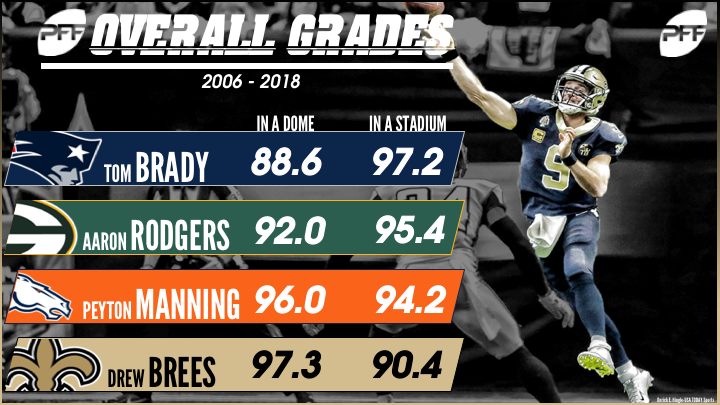 Nowhere is Brees’ excellence more apparent than in his overall grades, where he’s registered elite grades of 90.0 or higher in his career games in both an enclosed stadium (97.3) and in an open-air stadium (90.4). While his grade is significantly higher in his games at home (as is the case for both Brady and Rodgers), he’s still earned our highest attainable classification for his performances in the open elements. If the play-by-play grading doesn’t tell you all you need to know about the myth that Brees turns into an average quarterback when he’s outside the comfortable confines of the Superdome, his career passing numbers will, as his numbers from dome games and his numbers from open-air games are eerily similar, and both sets of numbers point to one simple fact: Drew Brees is in the upper-echelon of quarterbacks, no matter which field he steps out on. His career passer rating of 93.6 in stadiums is almost 10 points above the average in the PFF era (84.7) and ranks seventh among the 73 quarterbacks who have logged at least 500 attempts in a stadium over the last 13 seasons. 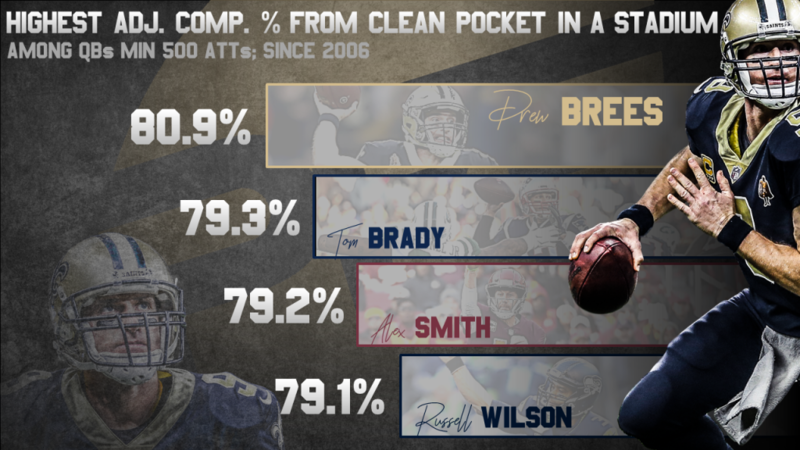 When we look at passer rating from a clean pocket – the most stable metric for evaluating and predicting quarterback performance – we can see that Brees’ rating of 103.2 ranks ninth among the 60 quarterbacks with at least 500 attempts from a clean pocket and is, again, well above the NFL average (96.0). Looking at his figures in a dome setting paints the same picture. Of the 56 quarterbacks who have logged at least 300 attempts in a dome over the last 13 years, Brees’ passer rating of 104.0 ranks fourth and far and away surpasses the NFL average of 84.7, while his 114.3 passer rating from a clean pocket ranks third among the 43 signal-callers with at least 300 attempts from a clean pocket. 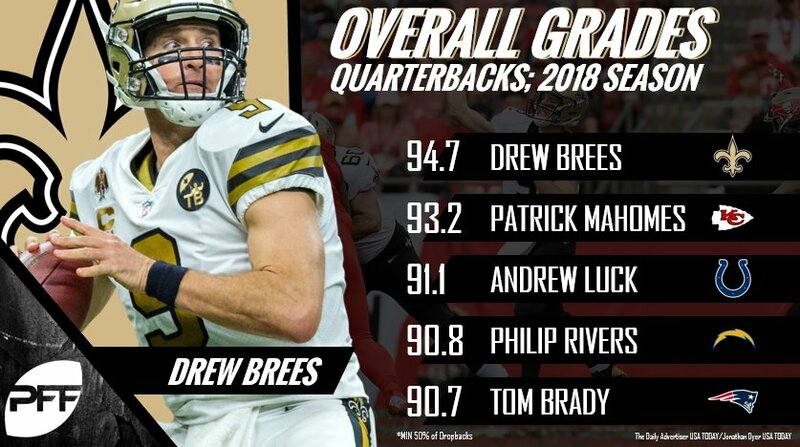 Comparatively, his 79.0% adjusted completion percentage in a dome slightly betters his 77.4% adjusted completion percentage on throws in a stadium, but the latter ranks first among quarterbacks in the PFF era, while former is good for second place behind Kirk Cousins. In a stadium, just 12.0% of Brees’ throws have been negatively graded, while just 10.0% of his throws in a dome have been negatively graded – both of which are good for first place among quarterbacks. Long story short, Brees is a top-10 quarterback regardless of the venue, and while his numbers are stronger when he’s played in a dome setting (as is the case for most quarterbacks), it shouldn’t take away from the fact that Brees is as still among the best when it comes to playing outside. For the last 15-plus years, the defining characteristic of Brees’ play has been his pinpoint accuracy, and he’s been as consistent as they come in this regard, as the Saints’ veteran signal-caller has now placed in the top-five in adjusted completion percentage in 10 of the last 13 seasons that PFF has data for. As you’d expect, nothing changes for Brees when he steps foot outside the Superdome. On his 1951 attempts from a clean pocket in an open-air stadium within the PFF era, 44 have been batted at the line of scrimmage, 13 have been spikes, 115 have been dropped, and 21 have been thrown away, which gives him an adjusted completion percentage of 80.9% – the best mark among quarterbacks with at least 500 attempts and the only mark above 80.0%. To hammer the point home, we can compare his performance and accuracy on his throws of 20-plus yards downfield, which takes away the easier, “expected” throws from the data set. In an open-air stadium, where many think he falters, Brees has completed 120-of-272 attempts for 4200 yards, 37 touchdowns, and 14 interceptions. His passer rating of 109.1 on those throws ranks third among the 31 quarterbacks with at least 200 deep pass attempts in a stadium, while his 15.4 yards per attempt, his 48.2% adjusted completion percentage and 50.7% positively-graded throw rate all rank first. In comparison, Brees has logged a passer rating of 104.3 on his deep attempts from an enclosed setting – good for seventh among qualifying quarterbacks – while his 16.6 yards per attempt, 52.3% adjusted completion percentage and his 51.8% positively-graded throw rate still all rank first. Right now, Brees and the Saints are just two games away from a Super Bowl appearance, which would be the second of Brees’ illustrious career. In the leadup to that game, should they get there, there will be a cacophony of noise suggesting that Brees will be at the advantage because the game is to be played at Mercedes-Benz Stadium. While that may be true in the sense that Brees has played a lot of football at the home field of his divisional rival, it will make no difference from a pure football perspective. Brees has been an elite quarterback regardless of the venue. Drew Brees is Drew Brees, no matter where he plays.